Instant Pot Chicken Bruschetta is a fresh, light, quick, and EASY Instant Pot Chicken Recipe! Bruschetta Chicken with tomatoes, basil, balsamic, and parmesan cheese has always been one of my favorite recipes, and it’s only better made in an instant pot! Instant Pot Bruschetta Chicken is one of our go-to easy weeknight meals. This Instant Pot Chicken Bruschetta Recipe is SO delicious. 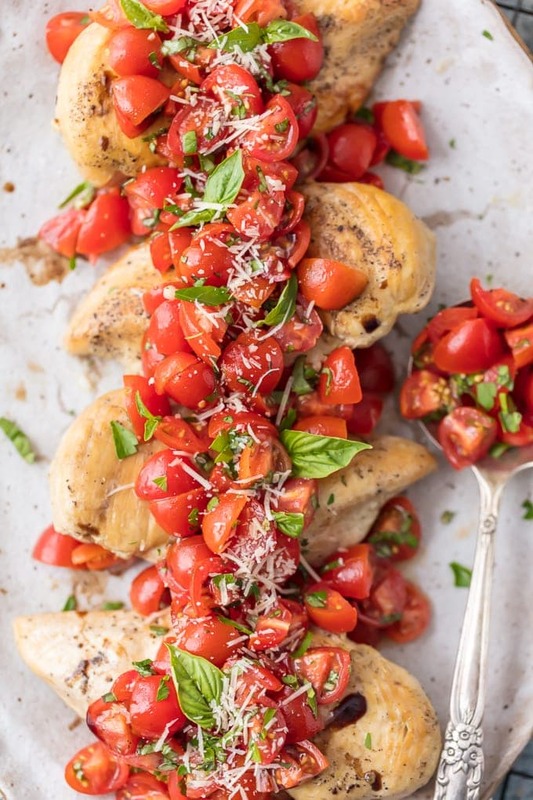 The flavor combination of the chicken, tomatoes, balsamic, basil, and parmesan is so simple but also so out of this world. 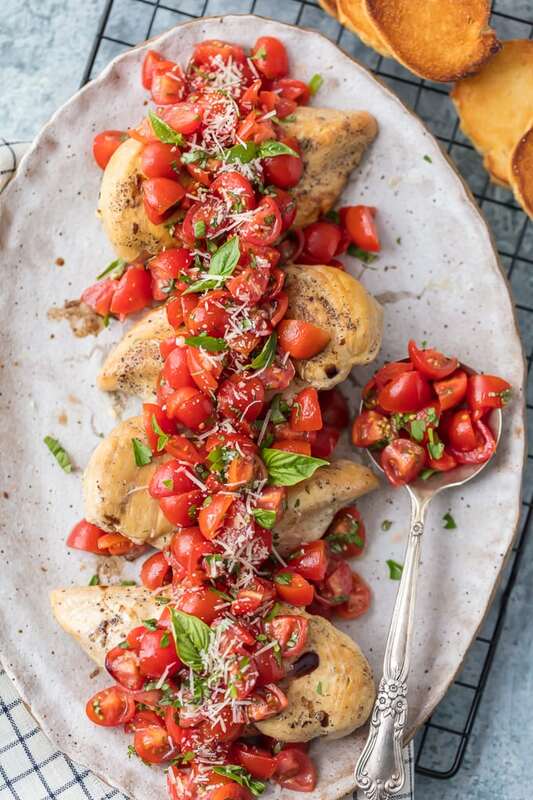 This Bruschetta Chicken makes me feel like I’m back in Italy enjoying life, one bite at a time. 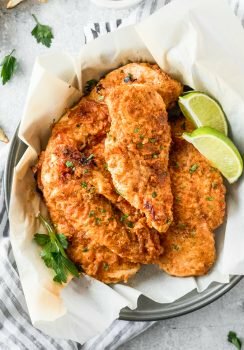 I crave recipes like this Instant Pot Chicken because they’re made in under 30 minutes, as quick to clean up as they are to make, and loved by all. 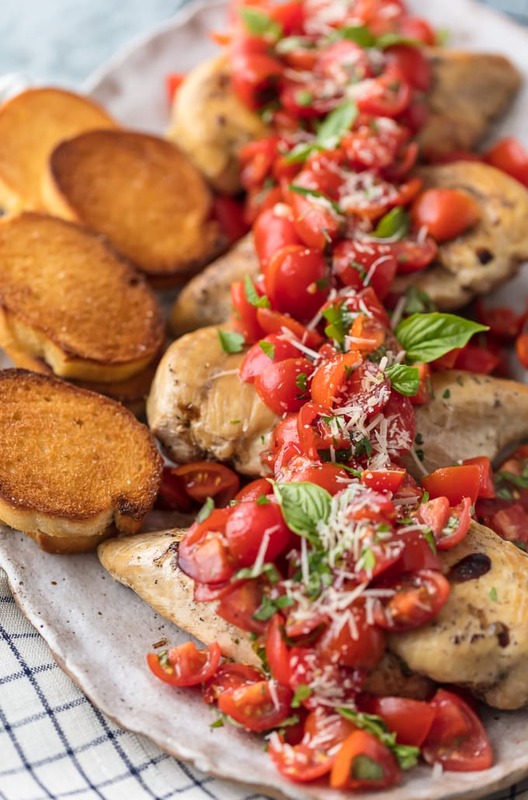 Your family will request this Bruschetta Chicken Recipe again and again! Instant Pot Chicken Bruschetta is one of our absolute favorite flavor combinations! 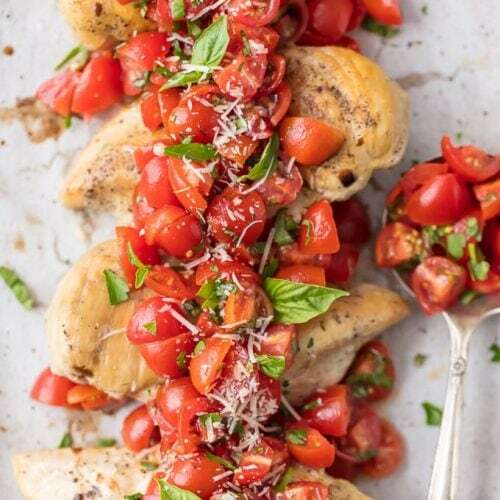 We have always loved Caprese Salad (tomatoes, basil, mozzarella, and balsamic) and with the switch of mozzarella to parmesan, this Bruschetta Chicken is just as delicious. We have made Grilled Bruschetta Chicken back in the day, but this was our first time trying it in an Instant Pot! We have linked to our favorite Instant Pots in the “shop this post” section below. If you haven’t tried it yet, today is the day! This Instant Pot Chicken Bruschetta would be the perfect starter recipe for getting used to your Pressure Cooker. What are some good side dishes for this Instant Pot Chicken Brushetta? 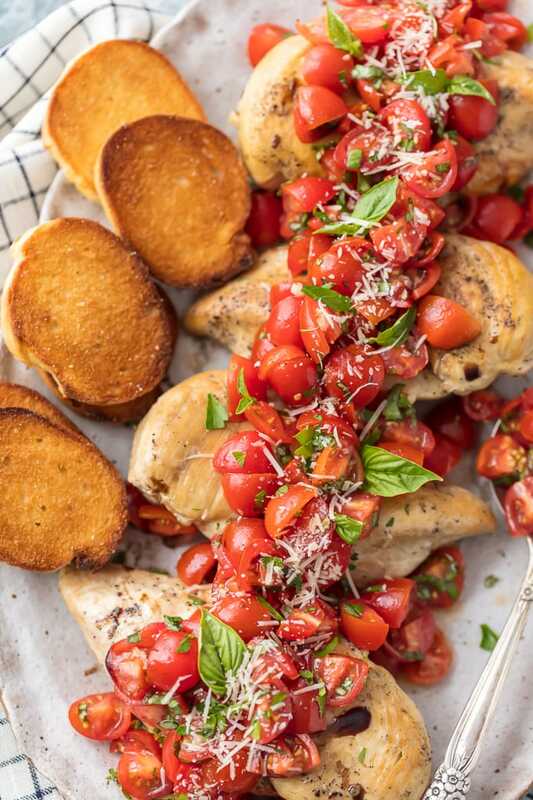 We love to serve this Bruschetta Chicken Recipe with our Herb Roasted Potatoes, Crock Pot Potatoes, Brussels Sprouts, or Garlic Butter Hawaiian Rolls. 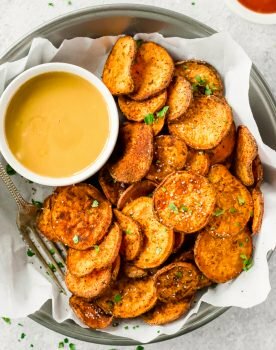 You can’t go wrong with a simple and delicious recipe like this. The Chicken speaks for itself. Do you have other favorite Instant Pot Chicken Recipes? We have been LOVING our pressure cooker lately and making anything and everything! We love Instant Pot Chicken Tortilla Soup and have compiled some of our favorite Instant Pot Chicken Recipes. So many good ones to choose from! You can! If you are cooking meat frozen, it will need approximately 50% more cooking time inside the Instant Pot. So take that into account! I hope this Instant Pot Chicken Bruschetta helps you find your love for your pressure cooker! This is such an easy weeknight meal under 30 minutes and full of flavor! See the recipe card below for full details on How to Make Instant Pot Chicken Bruschetta. Enjoy! Instant Pot Chicken Bruschetta is a fresh, light, quick, and EASY Instant Pot Chicken Recipe! 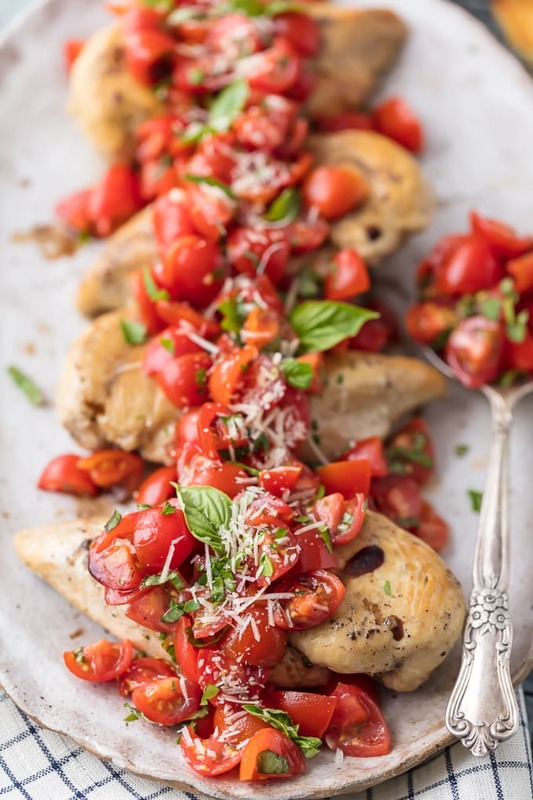 Bruschetta Chicken with tomatoes, basil, balsamic, and parmesan cheese has always been one of my favorite recipes, and it's only better made in an instant pot! Instant Pot Bruschetta Chicken is one of our go-to easy weeknight meals. Season the chicken breasts with salt & pepper. Set the Instant Pot to “Sauté”. When hot, add the olive oil and allow the oil to heat 30 seconds. Place half the chicken breasts in the bottom of the pot and cook 3 minutes per side. Transfer the seared chicken to a plate. Pour 1-tablespoon oil in the pot and sear the remaining breasts. Add the garlic to the pot and sauté 30 seconds. Pour in the chicken broth and white wine while scraping the bottom of the pot with a wooden spatula. Place the seared chicken in the pot, and sprinkle it with Italian seasoning. Turn off the Instant Pot, and cover it with the lid. Set the valve on the lid to the LOCK position. Select the “Manual” button, HIGH pressure and set the timer for 6 minutes. When the cook time ends, turn off the Instant Pot. Let the pressure release naturally 5 minutes, cover the pot with a dishcloth and open the release valve. The lid is safe to remove when the red valve drops. In a large bowl, toss together the tomatoes, olive oil, fresh basil, garlic, salt and pepper. Cover and refrigerate until ready to serve. Transfer the chicken to a serving plate, top with Bruschetta tomato topping and freshly shredded Parmesan. Drizzle with balsamic vinegar and a couple of slices of toasted baguette. My KIds LOve this Thank you so much for sharing this idea. Planning to serve the same in my son birthday party. Omg this sounds amazing! i love that you made this in the instant pot. my instant pot is my new love and i am always looking for recipes! I love it too!!! Can’t get enough of every recipe I’ve tried!! So fun and easy. Yum this looks so good! I need to get an instant pot! YOU DO! It’s so awesome! I was looking for recipes to make in my new Instant Pot. Found this one and made it. It was simple to make and was very tasty. I loved having something different to do with chicken!